New Farm Animals-millions of them! My husband doesn’t like yogurt but he’s been wanting to get more probiotics into his diet. He bought probiotic supplements and I started by reading a few recipes for different things to make. When I came across kimchi (a Korean fermented cabbage) I thought it sounded worth a try. Then while at a friend’s house I saw a jar of cabbage on her counter and asked her about it. She said it was kimchi. She was having a lot of fun and said it was easy and delicious. I read a few different ways to make it and decided to try this recipe posted by Emily Ho. She highly recommends reading The Art of Fermentation by Sandor Katz. I immediately requested it from my library. I love the kimchi. I’ve spread it on sandwiches but my favorite way to eat it is with tortilla chips and a beer. Now the fermentation bug has taken hold of me! First, I will introduce you to kombucha. Technically kombucha is, “a sugar-sweetened tea fermented by a community of organisms into a delicious sour tonic beverage” as defined by Sandor Katz. He goes on to say that its taste is sometimes compared with sparkling apple cider. I would personally love to replace soda with some sort of healthy choice so I was very excited to try this. We don’t buy a lot of soda but there’s just nothing else like a ginger ale it when you are sick and you need something bubbly to keep the nausea away. To make kombucha you need a SCOBY (symbiotic culture of bacteria and yeast) in a little original liquid, some tea and some sugar. The tea should be black, green, white or other styles of tea as long as it is made from the tea plant (Camellia sinensis). Herbal and heavily flavored teas are not advised. The sugar should be plain white sugar. If you have questions about what kinds of sweeteners you can use, I found a good sugar FAQ here. Two out of the three ingredients are obviously not a problem. I started looking for a SCOBY by searching the internet on how to grow your own. I read that you used to be able to make one from GT’s Original but then I read a conflicting post that said their recipe had changed and would no longer grow one. I was going to try but I accidentally cooked it. One thing I read that I was going to do if I got desperate was to try starting one with Bragg’s Apple Cider Vinegar but I never got around to researching it. Sandor Katz says in his book that some analysts have come to the conclusion that the ACV vinegar “mother” and the kombucha mother are exactly the same. Anyway, I decided to ask around on facebook to see if anyone I knew was brewing some. I got some great leads and some recommendations for websites. But no one that close to me had a live culture to share. I almost ordered one for about $25 and then thought I should check craigslist. Sure enough, I found a lady selling SCOBYs for $5. I know, you are probably thinking, “this is gross enough without involving some stranger you meet through craigslist!” But I thought, for $5 I’ll take the risk. My plan was to see how well I liked her and if I liked her and her kitchen then I would keep it. If not, I would say thank you and then throw it out. So, today I went to town to do errands and to meet up with this kombucha farmer. And, sure enough, she was great! I had a feeling from her emails that I was going to like her. She even lived in my old neighborhood. Wanna see what she sold me? 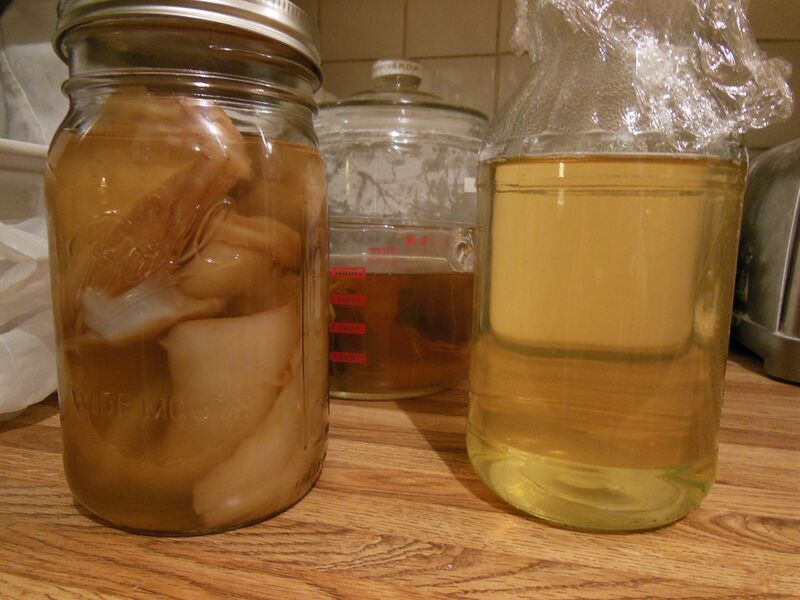 The SCOBYs are on the left and the kombucha starter tea is on the right. The starter tea is to get you off and running even faster. *This instructor uses tea bags…black & green. Oolong is almost black tea. I found that too much black tea can create a really strong brew so I don’t use it every batch. *Hmmm…she also recommends only brewing in clear glass, not even ceramic jars. My brewing vessel is food grade porcelain. My bonus extra million or so farm animals came when the kombucha farmer and I were talking about yogurt. 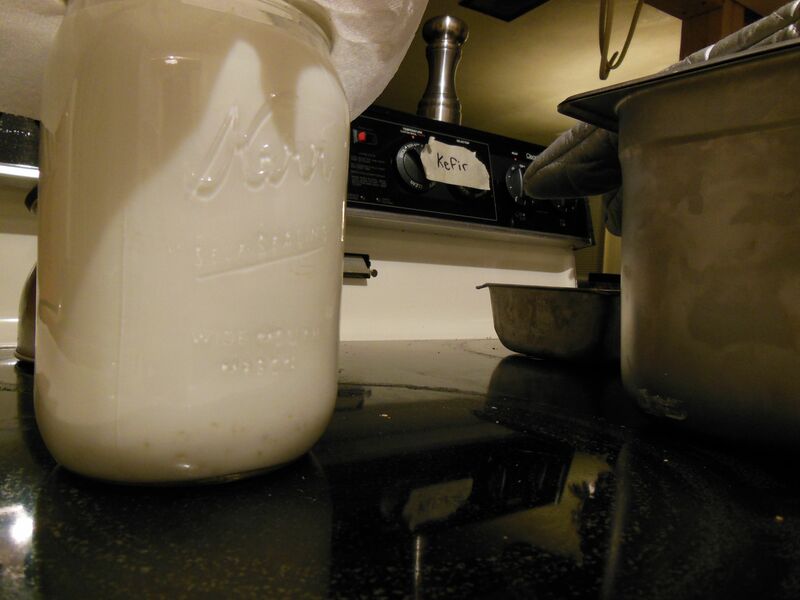 She dived into her fridge and strained me out some kefir grains to try, too. I tasted kefir for the first time in her kitchen. It was very yogurt-like. Nice and tangy. She told me to feed it milk and let it sit on the counter overnight. See the note on my oven? That is to remind me that it is in there so I don’t accidentally cook it, too. It likes a rather warm place and I had baked pizza earlier so it was nice 80-90 degrees in there. 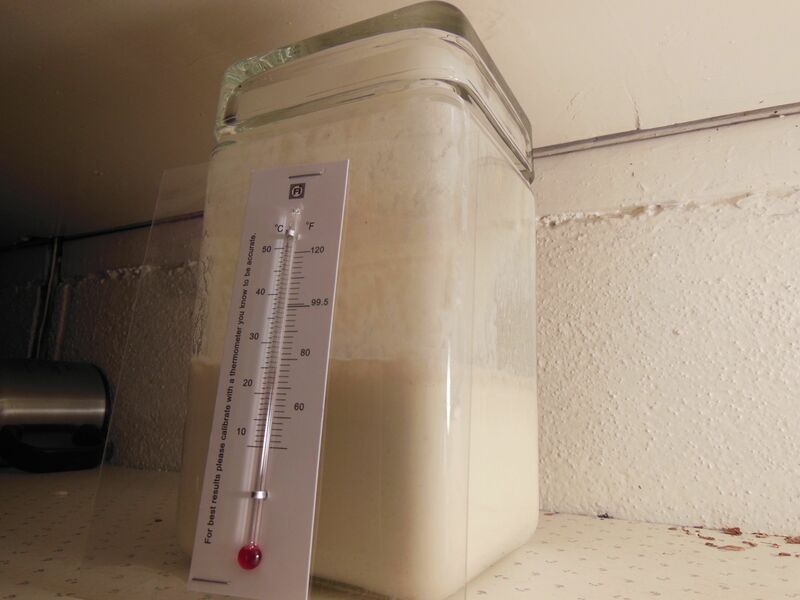 My last culturing experiment is with a sourdough starter that I began about a week ago. This entry was posted in Family, Fermenting, Food and tagged Apple Cider Vinegar, kefir, kombucha, mother, mother-of-vinegar, SCOBY, sourdough. Bookmark the permalink.